137 mins. Rated PG-13 for prolonged frenetic sequences of violence, action and mayhem, suggestive content and brief strong language. And here we are, after six films, we arrive here at Furious 7, the latest installment in the high-octane series of car action films started with The Fast and the Furious some many years back. 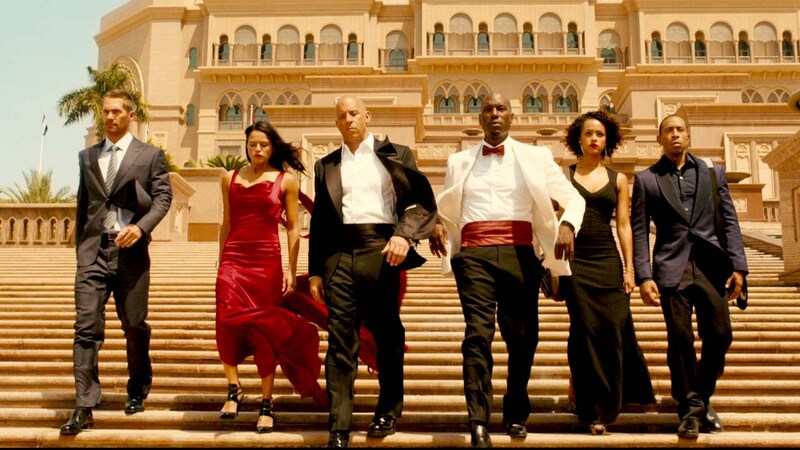 In the newest adventure, Dominic Toretto (Vin Diesel, Saving Private Ryan, Guardians of the Galaxy) and his family have returned to the United States after gaining amnesty for their previous offences. As new parent Brian O’Conner (Paul Walker, Brick Mansions, Hours) adjusts to the simple life with wife Mia (Jordana Brewster, TV’s Dallas, Home Sweet Hell), he and Dom discover that Deckard Shaw (Jason Statham, The Transporter, Spy) is seeking vengeance on them for his comatose brother. When Hobbs (Dwayne Johnson, G.I. Joe: Retaliation, WrestleMania) is dispatched, the group realize that they need help. In comes a mysterious government agent (played by Kurt Russell, The Thing, Poseidon) who need them to find a piece of high-tech gadgetry that has been stolen by the villainous Jakande (Djimon Hounsou, Gladiator, Seventh Son). The deal is simple: retrieve the tech in exchange for cart blanche to defeat Shaw. 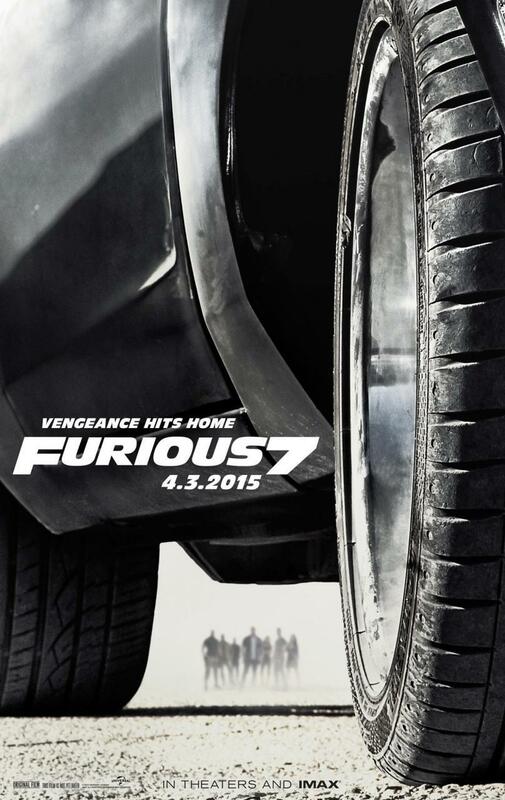 I really enjoyed Furious 7. Director James Wan (Saw, Insidious: Chapter 2), known for his abilities as a horror director, supplies the film with much-needed cheese with an incredibly exhilarating experience. The returning cast has grown so close that the chemistry here is great. Diesel’s journey of reintroduction with Letty (Michelle Rodriguez, Avatar, Machete Kills) is one of the better stories to come out of this series, and it ties into the franchise well. I had a lot of fun watching the banter between Roman (Tyrese Gibson, Transformers, Black Nativity) and Tej (Chris Bridges, New Year’s Eve, No Strings Attached). Newcomers Kurt Russell and Jason Statham provide a lot of fun to the equation. Russell’s Mr. Nobody is an interesting new character I’m excited to see further fleshed out. Statham’s Shaw comes off a bit on the cheesy side, especially with his introduction, but overall it works. Now onto what most people are interested in hearing about: dealing with the death of Paul Walker. Did it work? Suprisingly well, actually. I expected Walker’s role to be relegated to a glorified cameo, but I was wrong. With brothers Cody and Caleb, alongside some terrific digital effects, helped to provide some resolution to Brian’s story in an appealing way. The finale of the film definitely pays tribute well with a closing musical number with a montage of Walker’s role in the franchise served to button up his story and send him off to the next place without coming off as a wasted opportunity. Wiz Khalifa’s “See You Again” works well here, too. I like that Furious 7 helps tie the franchise back together with references to Toretto’s relationship with Letty before her “death” and the rarely-seen Race Wars from the original film. The best thing about this franchise is that the crew learns from previous mistakes to make the best film possible. Furious 7 isn’t the greatest film in the series (that honor lies with Fast Five), but it definitely takes a step in the right direction after a few missteps with Fast & Furious 6. It serves to provide closure to Paul Walker’s character and career well without sacrificing plot and sets the series up for further adventures which will continue with the upcoming Furious 8 (yeah, it’s happening).